While logging onto one of our clients Facebook Fanpages today I realized that I no longer had administrator access to their page. After making a few calls to the other Admins on the page we all realized that nobody (at least within our company had access to this page). Panic sets in…..
Not knowing the cause of the problem, we have spent the majority of the day researching how this may have occurred and what, if anything can be done about it. The page still exists, we can even post to it using HootSuite and other 3rd party applications, but all of our Admin privileges don’t exist. We research more and send several support help emails to Facebook, but from what we read it does not look like Facebook is of much help in situations like these. The thing that really caught my eye is that there was a space between the ‘y’ in Day and the exclamation point, just like on our page. 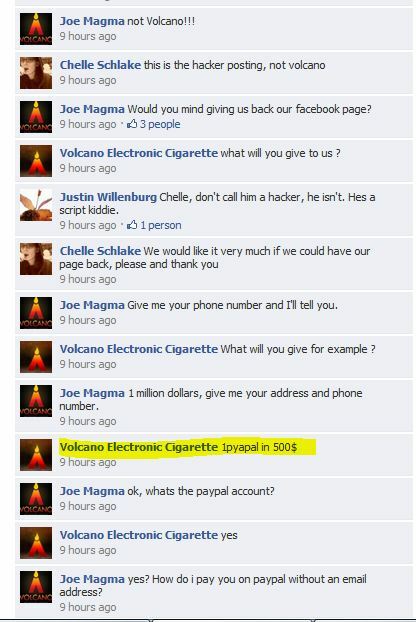 In addition to that, this ‘Happy Valentine’s Day !’ post was posted at exactly the same time as it was posted on the Volcano Electronic Cigarette Page. As I started reading the comments it turns out that this page was hacked and the owners of the page were being asked for a ransom for the return of their page. So I began to wonder, we’re probably not the only two pages that had this happen, and who is behind this? I began doing Google and Facebook searches for ‘bl00dy punKK’ (turns out 1 K is his typical spelling) and came upon a group of hackers known as the Republick of Kosova Hackers (RKH), of which bl00dy punk is a part. I found three other members of the RKH crew and after a little digging found two of the four in Facebook. From the looks of things, and what my Google Translator was able to translate in Albanian, these guys have been hacking websites for some time, and they think very highly of themselves. So I guess the Albanians have figured out some way to hack into Facebook fanpages. Facebook really needs to get their act together when it comes to security, just a week ago or so Facebook CEO Mark Zuckerberg’s own Fanpage was hacked. We will keep you updated on the story with our fanpage as it progresses. If anyone else is having similar issues we’d like to hear about it. And for anyone interested in leaving a nasty comment to any of these assholes, I linked to their fanpages on purpose. This just happened to my page, too. I find it quite frustrating that Facebook hasn’t released any sort of statement, and they’re not fixing the problem. Did you gave them 500$. No, we did not give them any money and were able to get our page back eventually. Looks like some others that were hacked were not so lucky though. How did you get your fan page back? Did facebook assist you or did you negotiate with them? My fan page was just compromised about an hour ago. Hey guys! we just regained control back of my girlfriends page!!! She created several profiles for advertising purposing and made herself as admin with several of them. One of them, she deactivated. Hacker(read Mickey Mouse), couldnt see deactivated profile! She logged in with it and removed him as admin! Please share this info with people to protect their fan pages since facebook is doing nothing!!! I was able to recover my account. Yay!! I contacted facbook through all the methods posted and actually got a response from the copyright infringement option. They basically that they couldn’t help me and they legally couldn’t remove the admin. They also said that fan pages couldn’t be hacked (playing stupid). So, I posted some links, mentioned that Mark Zuckerberg’s account had been hacked, etc and a few other colorful choice words expressing that they CAN do something about it. So they responded again a little less “copy-paste”. This time suggesting I create a NEW fan page and then submit this form for a FAN MIGRATION http://www.facebook.com/help/contact.php?show_form=page_migrations_external. I suppose this is the option that they have created to legally resolve this HUGE problem. Its better than nothing. Luckily I had an old deactivated account that I had added as an admin. I reactivated the account and was still listed as an admin so I removed the hacker!! This is his page http://www.facebook.com/profile.php?id=1464191711 I blocked and reported him. The hacker contacted me. He wants to know how I got my page back. He made a death threat also. Wow! We’ve seen them try extortion, but now death threats!! You may consider contacting the authorities, death threats are a federal offense. If the hackers are American then they could be in big trouble! This is an image of the initial messge. He’s sent a couple more saying “You’re DEAD LATRICE” and that he’s in Miami looking to “destroy me” . http://www.facebook.com/photo.php?fbid=10150098423483716&set=a.78733303715.79276.68866783715. I filed a police report at my local station, not sure of what other steps to take. His profile here http://www.facebook.com/miklovan.prenga says that he’s from Los Angeles although I believe he’s in Albania after doing an ip search. Our page was hacked too! Why is this thing happening? My Page got hacked the url of the pages are : http://www.facebook.com/funnmall , http://www.facebook.com/indiafly1 , http://www.facebook.com/mysmsmantra . can anyone tell me what can i do to take my page back. After writing the article, we received many comments and e-mails from people upset at us for using the word ‘hackers’ to describe these folks. Script kiddies- better term. This just happened to our page also. Why can’t Facebook restore Admins??? How did you bring back you page? Just asking, because our page has been hacked a while ago. We talked to the hacker and he said that he hacked our page because it’s more worth than us because we are not so good in speaking english. It’s his reason. Please help us to bring back our page. Our page is so precious to us that we’re all attached to it. that is hacked by the hacker and under his/her control since last 3 days. Sir, please understand the fact that We have put a lot efforts and money for this page, which is having more than 17,000 fans and this page is very much popular in our community, We afraid that Hacker will be misusing this page now and we really expect Facebook team to support us to get our page back. Your kind understanding and support will be highly appreciated. Please help me with my problem. Somebody hacked my facebook page and I almost become crazy when I knew it. It is a very big problem because I took care of my page. That page was deleted 4 days, hacked 56 days, deleted again for 1 day, hacked for 1 day, deleted for 111 days and now it is hacked again last November 28, 2011! I know facebook you can still help me for my problem because you have a good heart. Please help me recover my hacked page named “Julia Montes” and the URL is http://www.facebook.com/welovejuliamontes She is also an admin in that page and when she already knew somebody hacked my page she fell sad. She is a popular actress here in the Philippines and please Facebook recover my hacked page now. I worked hard for it, almost 180 plus days I haven’t update it! The hacker is “Bernadette Rose Nava Magno (Starr Chinkie)” and her facebook’s URL is http://www.facebook.com/profile.php?id=100000049880959. I worked hard for my fan page. Please I need to recover my page, my Christmas and New Year is so sad because I haven’t update my Julia Montes page because Bernadette Rose hacked it! Can I recover my page back? Please I am begging you facebook, I became a good person to her but she betray me, she removed me as an admin but the sad thing is I am the creator of the page! She is just my co admin and I know that you can help me facebook! Please recover my hacked facebook page and make me an admin 🙂 I am really sending many forms to you but you didn’t have an action so please facebook recover it now! Bernadette blocked me on my own page! Now I cannot comment even once. Please help me! Please recover it now my page and I need it today! Its 2012, I hope that you will recover it and hope that I can still be an admin of my own page! Thank you very much! Facebook is hacked and that means that every account you attached to Facebook is potentially hacked as well. All you bank accounts, paypal, myspace (if you still have one of those), twitter and on and on. Be aware that it is spreading like wildfire in my tiny network of 1500 Facebook friends. Since have been unable to access facebook for over 5 days I don’t know the depth of the damage, but a small silver lining is I’m actually talking to my friends on the phone instead of non-emotional “fb” messages across the web. It feels like a war being fought in another world. I don’t know if my friends (or at least their accounts) are still alive. Are they infected? Are they blocked? Are they wondering where I am? From what I’ve heard, I am MIA on facebook. A causualty of an attack from some person in the Philippines. I traced the IP address and it showed up as Manila, Philippines as the access point where my account was assassinated. They did this to advertise to my friends (Nike shoes no less!) or get them click and infect themselves. I watched as it happened and there was nothing I could do. Simply try to call a few of them and say don’t click it! But in most cases it was too late. They were corrupted, infected and then the virus/attack spread to all their friends. That was 6 days ago. Nothing has changed since then. I can change the password, stand on my head, change my secret codes and still, I have no access. So I wonder, is Facebook a safe investment? If a person or small group can destroy my Facebook experience in a few days, what could it do to the entire network? And what does that do to the value of Facebook? Spread the word, there is a war going on behind the scenes. And I expect the hackers to ultimately win as they always seem to be ahead of the curve. Especially if Facebook is going to just lay there and be silent on the issue. we’re all attached to it.